The Health Ministry will provide Rs one lakh to the hospitals for maintenance of the donor who has been declared brain dead till the organs are retrieved, the official said. New Delhi: The Health Ministry has proposed providing “social support” of up to Rs five lakh to the dependents of an organ donor in cases of cadaver organ donation. The social support will be provided not in the form of cash but by sponsoring medical treatment or education of dependents, said Dr Vasanthi Ramesh, Director National Organ & Tissue Transplant Organisation (NOTTO). The proposal under the National Organ Transplant Programme currently is under consideration of the Finance Ministry. Such patients who are in ICU require to be infused with fluids and medication to maintain the organs so that they can be transplanted. According to a senior health ministry, the gap between the number of recipients and donors is very wide and thousands of people spend years hoping for a donor who would give them a new lease of life. The official said that as per estimates, the annual requirement of the kidney transplant for new cases is around two lakh with merely 8,000 transplants happening annually. The figure is only for the new cases which means the number of people awaiting transplants over the years could be huge, she said. Similarly, the requirement of liver per year is 30,000, and only 1, 500 end up receiving the organ while the requirement for the heart is 50,000 and only 250 recipients. Around five lakh people are estimated to die each year in India waiting for the organ transplant, said a health ministry official. All these are estimated figures based on the information received from the states which are not complete as the data of not all the hospitals are included, a ministry official said. 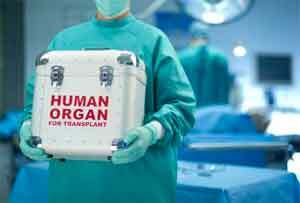 Concerned over lower rates of organ donation in India, the Ministry of Health is considering inclusion of step-parents, step-siblings and extended family members in the definition of “near relatives” in the Human Organs and Tissues Transplantation Act, 1994 (as amended in 2011) to ensure that patients find donors. The move comes after it received scores of grievances concerning the Act, apart from requests for organs due to non-availability of “near relative” donors or blood group mismatches with near relatives. “There is a lack of awareness about organ donation and also a lot of superstitions because of which people do not receive transplants despite their name being on a waiting list,” the official said. Elaborating on the procedure, NOTTO director Dr Ramesh said that when a person requires an organ transplant, the patient’s name is enrolled in the waiting list by the hospital. “We still don’t have the exact figure of patients who require organ transplant at the national level as some private hospitals do not communicate their waiting lists to NOTTO. We have been consistently writing to the states seeking details of persons who need transplants as we are in the process of creating a National Registry,” She said. Every hospital having a waiting list is supposed to get their data added to the centralised website of NOTTO, the country’s apex organ donation agency. Waiting lists for kidney transplants are the longest in the country, followed by those requiring liver transplants. There are three types of donors — a living related donor, an unrelated living donor and SWAP donors — besides cadaveric donations. Under the living related donor category, only immediate blood relations like parents, siblings, children, grandparents and grandchildren can donate their organs. Spouse is also accepted as a living donor in the category. Under the unrelated living donors, anybody can donate only for the reason of affection and attachment towards the recipient. Such donations are first permitted by a hospital committee and then by a state-appointed committee to ensure that the donation is non-commercial. It is this category which gets misused and opens doors for the trading of organs as it gives hospitals power to decide on the donor. In cases where the living near-relative donor is incompatible with the recipient, provision for swapping of donors between two such pairs exists. Besides, there are cadaver or deceased organ donations. Recipients on this waiting list receive organs from those patients who have been declared brain dead and or who have died of cardiac arrests.